Ten plagues had hit Egypt. The land was completely destroyed, livestock killed, and every family had lost their firstborn. Building the land back up was going to be an enormous task and they had lost the Israelites and their free labor. Pharaoh decided to prepare his army and get their slaves back. 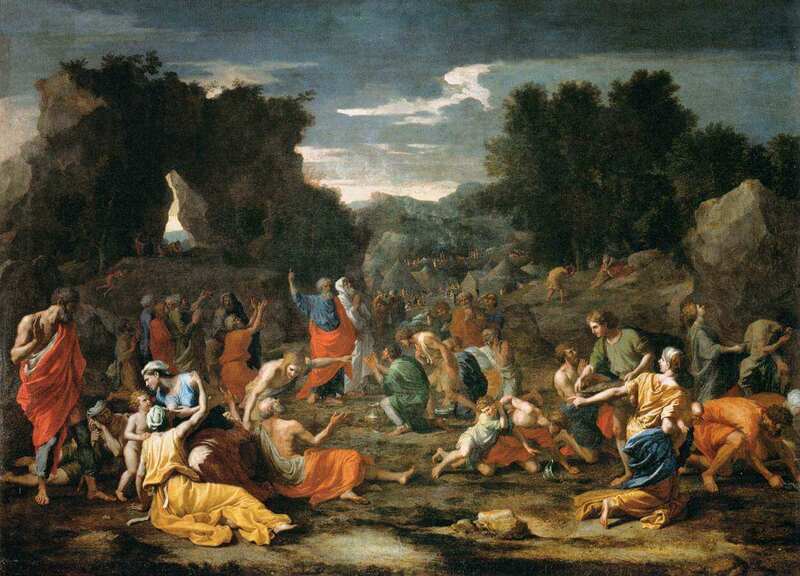 The Israelites receiving manna in the desert. The Israelites were camped by the sea when Pharaoh and his army approached. They had told Moses loud and clear that they were not interested in his plan of taking them out of Egypt. But Moses had done so anyways. Moses had told them that the Lord was going to bring them back to the land that was promised to Abraham, Isaac and Jacob. But instead of taking the road through the Philistine country he led them into the desert, moving around from one camp to another to another, ending up by the sea with no way out. The Israelites were terrified. Moses lifted up his staff and the waters of the sea were divided. As strong wind drove back the sea and there was a path of dry land with walls of water on either side. There suddenly was a way out, a way to safety. The Egyptians followed them, but the wheels of their chariots got stuck. When all the Israelites had made it through the Lord made the waters of the sea flow back. The entire Egyptian army drowned. The Israelites feared the Lord and put their trust in Him and in Moses his servant. If this was a fairy tale, this would be were it ended. They’d all live happily ever after. Except it was not, because this was a real story with real people. The Israelites who came out of Egypt were a people born into slavery. It was all they had ever known. They had heard the stories of Abraham, Isaac and Jacob and of a God who had promised them and their descendants some amazing things. It almost sounded to good to be true, like a fairy tale. Because life was hard, they suffered every single day, their baby boys killed, a life full of fear. They might have dreamt of being free, but they had no idea how to be free. So, every single time trouble arose, they wanted to go back to Egypt. Back to living in fear. It is only three days after the Lord parted the sea that they complained about the bitter water. They complained about the food, which in their memories was much better than it really was back in Egypt. They complained about lack of water again, and looked back with longing to their lives in Egypt. As free people we can almost get annoyed at the Israelites. Look at all the Lord is doing for them; how can they keep complaining? How can they not trust the Lord? Why is it so hard for them to see that the Lord is with them? But the Lord saw their hearts and knew that they were afraid. And he poured love into them. He split the waters of the sea. He gave them water to drink and food to eat. Because it is perfect love that drives out fear (I John 4:18). It is that same love that the Lord has for us. He knows our fears. And He pours out love. It is that kind of love that we get to pour into others. We may not know their fears, but we know that love is stronger. And instead of getting annoyed or judging someone for what we see as lack of faith, let’s pour out love. Just like the Lord did for the Israelites in the desert.